Inclusive leadership is a key component to creating a team-centered atmosphere which moves mountains—both in the office and in the world. Numbers don’t lie. If you want your team to succeed in creating and executing groundbreaking ideas, you need to engage your people in all their glory. Active listening is the principle of listening to understand and act, not listening to respond. Most people only listen to enough context so they can reply intelligently to their counterpart. However, leaders are those people who truly hear not just the words but the intention behind the words that are spoken. Picking up these nuances comes with practice, but the easiest way to know what your employee is truly saying is if you listen from the beginning of the conversation and ask open-ended questions which lead to explanations. Diversity is a trending topic in the business world today. Most businesses have a certain “quota” for differentiation they strive to meet when hiring. However, just because you have a child genius on your team doesn’t mean your purpose for diversity is complete. You need to utilize this kid’s expertise if you want it to be useful for your team. The same goes for talking to your employees from different backgrounds. Their personal history could be incredibly useful to your company, but you need to facilitate an environment which encourages difference in thought and opinion in order to gain that oh so powerful perspective. Kaizen leadership was developed in Japan and improved by the Toyota company. The basic principle is simple: use everything as much as possible. If there is a corporate waste, find a way to recycle. If employees are making mistakes, create a program to teach them how to rectify their mistakes. The easiest way to foster this environment? Your mentors are learning to sharpen their own skills through the teaching process. Implementing the Kaizen mentoring technique is easily the most effective way to be an inclusive leader. 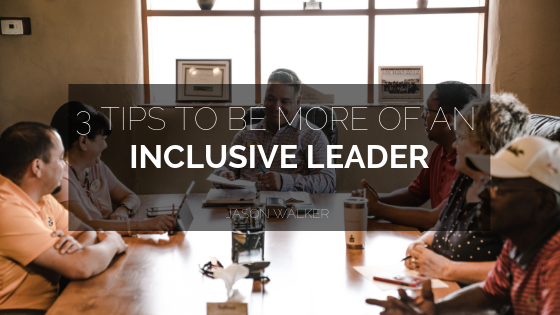 Ultimately, being an inclusive leader takes time, research, and the willingness to get to know your people on a personal level. Learn what makes your people tick through being a compassionate mentor and you will create a program of creativity and loyalty. Dr. Walker specializes in psychology, psychometrics, research, Indigenous relations, and civil mediation. Jason is know known for his work as an expert in the assessment, investigation, and intervention of workplace bullying, harassment, and sexual misconduct. Jason works with organizations on complex human resource issues, organizational development, policy development as well as mental wellness. Currently Jason Walker PsyD, PhD is based out of British Columbia, Canada.